As a homeschooling parent, I obviously love when I find a quality, educational resource to feed the interests of my kids. My nine year old has shown a lot of interest in history lately, so I was happy when we were offered the opportunity to review the newest production from Heirloom Audio. These are quality historical supplements that also double as wholesome entertainment for the entire family. We received a 2 CD set of St. Bartholomew's Eve, a full audio adventure based on the G.A. Henty novel of the same name. This is a story of the Hugenots, and the arrival of this story was good timing, as he had just read about the Hugenots in his history book, and he was asking questions. I popped the CD into the car on the way to co-op one day, and we got started listening as a family. We travel in about half hour drives, so this story only takes a couple of short trips. The story begins with some young lads sneaking out of church, essentially claiming they can worship anywhere. I thought this was an interesting way to lead into the crux of the story, religious freedom. The narrator then takes us back to the 16th century, with Philip, our young English protagonist. He is sent to his French relatives, where he assists with the French Protestant's plight. He is forced to test his courage and faith in God as he continuously defends the rights of the Protestants against the French Catholics. The story climaxes after Philip discovers white X's on their doors . . . leading to the St. Bartholomew's Day Massacre. This story is a reminder that our right to worship as we feel is right is the product of the faith, courage and sacrifice of many people, just like in this story. G.A. Henty wrote to an audience of adolescent boys, so this story is full of adventure and excitement, battles and bravery, but it is appropriate for boys and girls alike. As an audio adventure by Heirloom Audio, this story is full of fantastic music and sound effects that add to the suspense and bring the story to life. The sound of the crickets, the footsteps of an assassin, the swords clashing, the bells ringing - all the little details are not passed over, and you feel as if you're right next to Philip. My primary listeners are 11, 9 and 5, and the story can be hard to follow sometimes because of the action and dialogue, but it is still an excellent production and story, just as its predecessors. However, it does have some intense scenes, and a story of religious war can be a difficult topic for some children. Children often have questions or anxieties when they hear of religious persecution, so I definitely recommend listening alongside (if not ahead) and being prepared for any discussions that might arise. Heirloom Audio has released several titles in their Extraordinary Adventures of G.A. Henty series. We own all, and have reviewed all but one, so if you want to learn a little more about the series, or are looking for a different time period, feel free to check out my reviews. You can also read more reviews of St. Bartholomew's Eve from fellow crew members, or check out Heirloom Audio online. A few weeks ago I shared our field trip to Jamestown Settlement. We bought the combo ticket to the American Revolution Museum at Yorktown and went later in the week. The two museums have a similar layout, with an indoor exhibit hall and the outdoor living history areas. The first time, we thought we'd 'beat the heat' and do the outdoor areas first, but we were so hot and tired, and the littles were then irritable, that we could hardly enjoy the indoor exhibits. This time, we decided to do the indoor exhibits first, which meant we weren't hot and sticky and tired while walking through, and the kids were more interested in everything - which meant we were able to spend more time actually reading placards, looking at artifacts and paintings, and enjoying the cannon exhibit. (Again, they requested no pictures indoors.) I loved the cannon exhibit they had, and the paintings. Outdoors, they had a Revolutionary War era encampment set up. We learned that there would about six people per tent, but the higher your rank, the less people per tent. Inside, you could see recreations of what the officer's tents would have looked like, with interesting props set up. Some tents were set up for "work" rather than sleeping, and this was apparently the medical area. She was talking about herbs and medicines. While this is what we saw inside . . .
Higher ranking officers had beds . . . In the far corner, we met a gentleman who talked to us about the food and cooking. They were able to examine food . . . This area was for the women and kids who followed the men . . . .
. . . and offered laundry services! There were a few games set up, and he played Shut the Box with the kids. Then we walked over to an Upper Middle Class farm. We actually started at the house, but I forgot to get a picture when we got there, but you can see the house, and the kitchen. Inside the house, she talked to us about a typical family and their home life. She mentioned that mom would probably teach them at home! My kids gave me the side eye. Dollies are of course interesting to 3 year olds! Eleanor has been really interested in checkers lately, and loves to play! Over in the kitchen, we learned more about typical meals, as well as how things were prepared and stored. Around the farm, we saw the garden, some animals . . .
as well as the slave/servant quarters. On the way out, we were told about how the kids had outdoor chores starting around his age. He had to work for his food! This was another fun historical field trip, if not ridiculously hot again! There are so many other historical activities and learning opportunities around in Jamestown, Yorktown and Williamsburg, but we couldn't do it all. We enjoyed the activities we did, but the kids wanted to do more than "just" history. We did walk around some of the historical towns to shop, and Emory insisted on a picture here, but this was the best husband could get . . . It was also 90-95 most of the week, which meant it was too hot for the littles to enjoy a lot of the outdoor historical stuff. So we spent plenty of time in the pools at the condo, one day at Virginia beach, and another evening at Yorktown Beach! This helped the kids get out some energy and cool off! Our last big field trip was to the Virginia Air and Space Museum! I'll share more on that soon! We have approached Bible readings in our homeschool in different ways over the years. Most recently, we have fleshed out the lessons in the workbooks from a children's ministry program at our church, but those lessons always seem to hop around. My eleven year old has transitioned from this program into a traditional middle school youth group, so I though we might do a general overview of the Bible this year at home. When searching for Bible reading plans for middle schoolers, I found a Bible reading schedule that is intended to give a solid overview of the Bible by covering at least a portion of every Book. I thought this would be a good idea for sixth grade, so when we were given the opportunity to review Books of the Bible at a Glance, from Teach Sunday School, I knew it would be a great complement to our reading plan. The purpose of these Book-By-Book Bible Printables is to help give placement and context, and to show the big picture of the entire Bible. Especially in children's programs, many reading plans hop around between Old and New Testament, only hit popular people and stories, and leave so much out. These guides are meant to give a solid overview from beginning to end. As I had hoped, these summary sheets work really well with our straightfoward Bible reading program. We started by printing off the first couple of Books and going over the page before starting the chapter. Every few days as we read another passage, we can review the cheat sheet and key points covered, so that we still have the right timeframe and context in our minds. While they are appropriate for all ages, I think upper elementary ages through adults will get the most out of them. I can see these being especially useful in group settings (Sunday School, Bible Study, Junior Church, Youth Group) before doing a book study, because you can pass these out to help put a book into context before studying it. It could aid in placing Biblical events on a history timeline. For anyone new to studying the Bible independently, these would be especially useful for placing things in context and understanding how the Bible fits together. For independent studies, you can keep these with your notes during devotions. If using the Most Famous Verses for memory work or copywork, you may choose your preferred version, but the included verses make choosing selections easier. Essentially, they are very versatile and can be used in many ways. I wouldn't hesitate to recommend these! To find out more about these Printable Books of the Bible "Summary Sheets" you can check out their website or social media, and of course, read more reviews to find out how crew members are using them in their homes! Most kids love mysteries and detective stories, so when we were offered the chance to review the book from Forensic Faith for Kids from David C Cook and Case Makers Academy, I was intrigued. 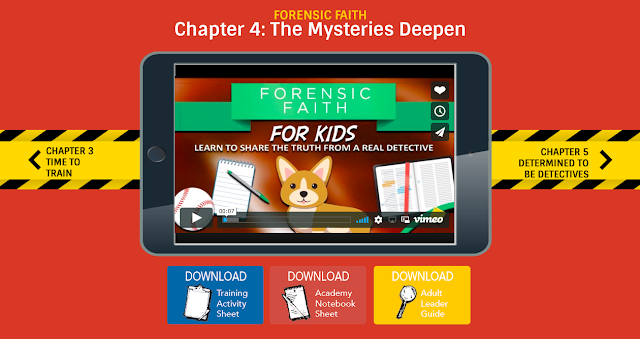 Forensic Faith for Kids is written by J. Warner Wallace and Susan Wallace, with Rob Suggs. A real cold-case detective, J. Warner Wallace used his own experience and expertise to investigate his way from being an atheist to a Christian. He now writes books for both adults and children on how to investigate the truth. There are two storylines within the book. The book starts off with children washing cars at a fundraiser, when a corgi appears. All they know is that her name is Bailey, but not where she came from or who she belongs to. The second major plot point starts at a youth group meeting, where friends are discussing another friend from school who showed up, but made it clear he questions whether Jesus is God. As cadets, the children learn how to investigate for truth. Warner uses his background to write to children, teaching them how to search for truth, organize evidence, and present a case. You can read the book straight through and gain a lot from it. I have read the book aloud to children 5, 9 and 11 and the two older children of course got more out of it. These ages could also easily read it independently, as it is targeted at 8-12 year olds. Along with the book, you can also find online supplemental tools. The Case Makers Academy website offers free videos and printable pages. Training Activity Sheets include things like Spot the Difference and Word Searches. They're like fun little warm-ups that have you paying attention to the details in front of you. Academy Notebook sheets are more like fill-in-the-blanks based on the readings. The Adult Leader Guide gives notes for reading the adult version of each book and preparing for the lesson with the kids, such as questions to ask. Warner's books for children include Cold Case Christianity for Kids, God's Crime Scene for Kids and Forensic Faith for Kids, and are designed to help children learn the truth about God and Jesus. These books are suitable for mid-elemetantary through early middle school (8-12 years) and can be used by families or small groups, even children's church programs. I could also see them being used in a co-op setting as well. Each of these books has an adult counterpart, which is suitable for teens. In this way, groups with a wide age range or families with teens can all study together. Pre-teens and teenagers often have a lot of questions about their faith, or how to discuss it with their friends, and this book can be a good conversation starter. To find out more about Forensic Faith for Kids or the other books in the series, you can check out Case Makers Academy website, find them on Facebook or read more crew reviews!